The HexSite's unique geometric design may just revolutionize close-quarter pistol shooting. 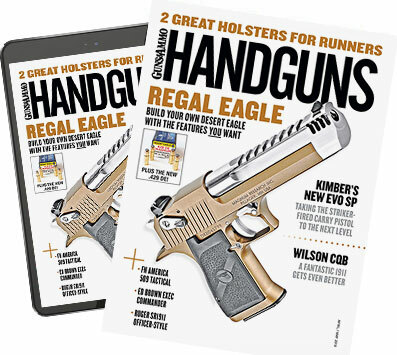 For more than 100 years, one of the more compelling questions regarding the use of the handgun has revolved around the way the "short gun" is best aimed at the intended target. Two distinct schools of thought eventually evolved. The first school espoused the belief that the sights of the handgun were intended for use when there was no immediate threat to the shooter and there was enough time to employ them. Sighted fire, therefore, was best used while engaging targets at the firing range or when facing a threat from a distance or from behind cover. These same adherents, however, believed that in close-quarter combat the shooter must be able to effectively aim the weapon with his eyes locked onto his adversary and not the sights. The argument for this approach--most often raised by people who had actually experienced spontaneous, close-quarter, violent encounters while armed with a handgun--was based on the fact that when faced with a human being who presents an immediate threat at fairly close distances, our innate responses will compel both our eyes to open wide and focus on that threat. Compound this startle-based response with the usually fast time frames found in most violent attacks and you can understand why members of this school so strongly believed in developing both sighted shooting and point shooting skills. There have been many proponents of this school through the decades, but the dean was undoubtedly the late Col. Rex Applegate. The second school of thought, most readily identified by the sobriquet of the Modern Technique of the Pistol, established a doctrine of 100 percent sighted fire under all but the most extreme, contact-distance conditions. The late Col. Jeff Cooper was the standard-bearer for this school, and his much-publicized belief in the use of the sights for all shooting activities--including close-quarter combat--was accepted and widely adopted by the majority of shooters in the U.S. and abroad for nearly 30 years. However, in just a few short decades, the river of time has worn the glaze off the Modern Technique's cornerstone. With the advent of a number of studies on how human beings react when facing a threat, advances in training practices and the study of combat physiology and psychology, many people began to reexamine this issue in a new light. I count myself among their number. My own experiences while serving as a state police officer and firearms trainer led me to adopt a new firearms training philosophy based on free thinking and critical analysis--and to question whether either the Applegate or Cooper schools of thought were based on solid foundations. According to Elmer Keith, sights didn't become standard equipment on handguns until after 1836 when the revolver came into general use. Since then, many different types of sight designs have been developed for the handgun. Like many other aspects of pistolcraft, many of these designs have also been "reborn" and reinvented over the years, with various modifications made to the basic established designs. Approximately 116 years ago, a gentleman from New England named E.E. Patridge created a handgun sight design that would remain popular until the present day. Named for their inventor, these sights can be recognized by their simple and efficient design: a square front sight and square rear sight notch. In A.L.A. Himmelwright's book, Pistol and Revolver Shooting (first published in 1908), Patridge is quoted explaining how to use his sights. The heart of the HexSite: six implied equilateral triangles that draw the eye to converge automatically on the center of the aperture. "In using these sights bring the front sight into the rear notch, making a straight line across the rear bar and the top of the front sight in the notch opening, so the eye will see a black square with two lines of light of equal width on each side." Today, Patridge-type sights are still being produced and used in the same manner. So where's the rub? Here's the rub: Patridge poured considerable time, energy and money into research and development of a sight for target shooting, not combat. Over the years, Patridge sights have been modified with colored paint, or luminous inserts have been added to both the front and rear sights in an effort to improve the ability of the shooter to see and focus upon the sights under various lighting conditions. But those modifications don't change the fact that the Patridge was created expressly for achieving accurate hits on non-threatening paper targets while the shooter's focus was maintained on the sights, not the target. Once you understand that, you will realize that both schools of combat thought are irrelevant because both revolved around a sight that was not designed or intended to be used for combat shooting. If you think this is a spurious argument, consider for a moment the adoption and employment of red-dot sights on various long guns currently being used in combat theaters around the globe. The primary reason these types of sights have been embraced so enthusiastically is because they allow the shooter to verify alignment of the barrel with the threat while maintaining visual focus--with both eyes open--on that same threat. This design is effective because it works in harmony with the body's natural reactions to fear and stress as well as the need for the shooter to be able to determine, moment by moment, if the human being facing the muzzle needs to be shot or not. So why doesn't someone design a handgun sight based on these same objectives? Well, a few people have. Laser sights that allow the verification of barrel alignment while maintaining focus on the threat are becoming increasingly popular. There are also red-dot sights that have been modified for use on handguns. While initially intended for competition use, the combat applications of these types of sights are obvious. As for iron sights, the vast majority of "combat" designed or modified sights share the same flawed approach as the venerable Patridge: Regardless of shape or configuration, they are designed to be looked at while in the process of shooting the threat. Then along came Tim Sheehan. an has spent years working as a defensive pistol instructor, gunsmith and inventor. For more than 13 years, he has been relentlessly pursuing a specific goal, much as Patridge did back in the late 1800s. Also like Patridge, Tim also sought out the advice of professionals outside the firearms industry--most notably in the medical and behavioral sciences fields--in his quest to design a sight. But unlike Patridge, Tim's goal was a sight specifically for close-quarter combat. The resulting HexSite (Goshen Enterprises, goshen-hexsite.com, 928-284-1483) allows the operator to focus on the target, not on the sights, while keeping both eyes open. Due to the unique design of the HexSite, the operator is able to do just that while still benefiting from the presence of the sights. That is because the HexSite has been designed to be looked through, not at, while the operator is engaged in combat. An all-steel version is shown here on a Sig pistol to give you an idea of how the sight looks in profile. This version is installed by Goshen Enterprises. While at first glance the HexSite may appear to be a variation of a set of standard front post and rear ghost-ring aperture sights, it is actually something quite different. Sheehan's design consists of a rear hexagonal-shaped aperture and a specially machined front blade sight. The front sight has been designed to collect light from any direction and produce a subtle glint at its top. The extensively machined rear aperture offers 16 angular reference points that, according to Sheehan--and experienced by me, for one--are subconsciously accessed when the pistol's sights are aligned with the eye. The recessed concavity at the rear of the aperture produces a dark shadow. Because this shadow is so much darker than the surrounding environment, you get maximum contrast with the target in every lighting condition. The effect for the eyes is to perceive the target through the sight as being brighter or of higher value, resulting in better focus on the target. As for operating in extremely low-light environments, Sheehan believes that if lighting conditions are too dark for the HexSite, it is too dark to identify the target and too unclear to shoot at with any sight, at least without flashlight illumination. Here's how it works, according to Sheehan: "The HexSite presents six implied equilateral triangles which involuntarily draw the eye to an exquisitely refined convergence at the center of the hexagonal aperture. The angles are reflexively congenial with the eye's inherent physiological makeup, so that the eye effortlessly locates and perceives the sight's precise center. One user commented that it was like using invisible scope crosshairs. "The shooter's eye simply cannot dismiss the hexagonal structure's unconscious demand to place the top of the front sight's unfocused-upon top at the center of the sight, which also places it right on the target the shooter is focusing on." Bottom line: While the shooter is seeing the target, the subconscious is "seeing" the sight. One of the core concepts of the HexSite System is that when used correctly by a shooter in a stressful situation, the sights actually disappear even as they effectively assist the shooter to focus on the target. While it takes a little time to adjust to this idea, especially if you've been using Patridge type sights for any length of time, the validity of the concept can be easily demonstrated while dry firing. Simply stare at an object with pistol in hand, both eyes open, and then quickly and aggressively raise the pistol to eye level while maintaining your focus on the object. I first became interested in Sheehan's work several years back, and after working with with the HexSite sights, I began to see what he had accomplished.It is an extremely interesting concept, based on a unique blend of science, superior craftsmanship, physiology, and more than just a little dash of Zen. I was so impressed I felt compelled to include a section about his sights in my book, Police Pistolcraft. The front sight looks like a simple affair, but according to the designer it's specially machined to collect light at its top and produce a glint under most usable light conditions. Aside from my own experience with the sight, I've spoken to some others who have worked with it. Sgt. D.J. MacMinn, supervising firearms instructor for Warren Township Police Department in New Jersey, became a proponent of the HexSite system after being introduced to it in 2001. Sgt. MacMinn successfully transitioned his department from traditional sights to the HexSite system over a two-year period beginning in 2003, and he reports a significant increase in the shooting abilities of his officers. "They were better able to see the target and were better able to make a quicker, more positive target acquisition," he says. Currently, the HexSite is undergoing an extensive series of trials with police recruit classes at the San Joaquin Delta College Public Safety Training Center under the auspices of Chief Jared L. Zwickey. According to Chief Zwickey, the results to date have been positive. Chief Thomas L. Klose of the Sanger, California, police department also became a believer in the HexSite after being introduced to it by Sheehan and having a set installed on his personal pistol. After working with the sights for a short time he was so impressed he ordered sets for every member of his 40-person department. Chief Klose will be preparing a base-line study once the sights are installed and his personnel have had a chance to adjust to the new system. The sights are available in custom-fitted steel versions, which are installed by Goshen Enterprises, or user-installable production for Glock pistols made of reinforced polymer composite. I recently installed a set of the latter (price, $129) on my .40 caliber Glock 22.
and perform as designed, and the composite material is extremely strong--stronger by far than the polymer factory sights they replaced. According to Sheehan, during torture tests the new polymer sights sustained significant damage only when struck with a hammer. For the record, while Tim Sheehan and I have become friends over the course of the past few years, neither I nor anyone involved with me has any type of monetary interest in Sheehan's company or products. I just want to make more people aware of the HexSite simply because he has developed an exquisitely thought-out and designed combat sight that I believe will assist pistol shooters to better engage threat targets during real-world encounters. Tim Sheehan has laid his stone in the river. It will be interesting to see what affect the waters of time have on it.